Researchers have developed the world's tiniest engine - just a few billionths of a metre in size - which uses light to power itself. The nanoscale engine, developed by researchers at the University of Cambridge, could form the basis of future nano-machines that can navigate in water, sense the environment around them, or even enter living cells to fight disease. The prototype device is made of tiny charged particles of gold, bound together with temperature-responsive polymers in the form of a gel. When the 'nano-engine' is heated to a certain temperature with a laser, it stores large amounts of elastic energy in a fraction of a second, as the polymer coatings expel all the water from the gel and collapse. 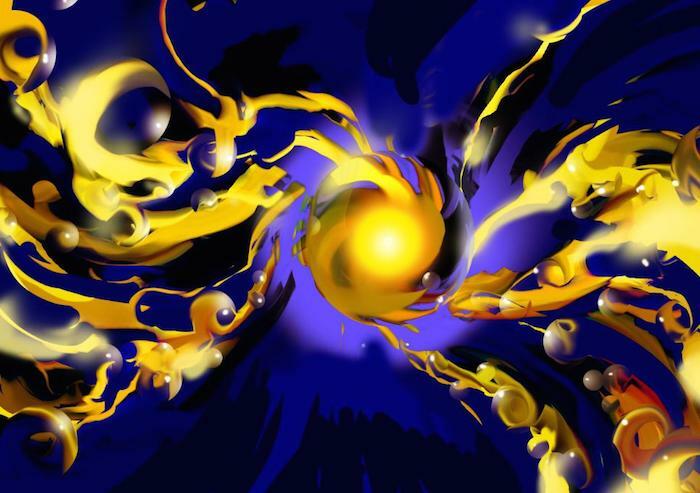 This has the effect of forcing the gold nanoparticles to bind together into tight clusters. But when the device is cooled, the polymers take on water and expand, and the gold nanoparticles are strongly and quickly pushed apart, like a spring. The results are reported in the journal PNAS. "It's like an explosion," said Dr Tao Ding from Cambridge's Cavendish Laboratory, and the paper's first author. "We have hundreds of gold balls flying apart in a millionth of a second when water molecules inflate the polymers around them." "We know that light can heat up water to power steam engines," said study co-author Dr Ventsislav Valev, now based at the University of Bath. "But now we can use light to power a piston engine at the nanoscale." Nano-machines have long been a dream of scientists and public alike, but since ways to actually make them move have yet to be developed, they have remained in the realm of science fiction. The new method developed by the Cambridge researchers is incredibly simple, but can be extremely fast and exert large forces. The forces exerted by these tiny devices are several orders of magnitude larger than those for any other previously produced device, with a force per unit weight nearly a hundred times better than any motor or muscle. According to the researchers, the devices are also bio-compatible, cost-effective to manufacture, fast to respond, and energy efficient. Professor Jeremy Baumberg from the Cavendish Laboratory, who led the research, has named the devices 'ANTs', or actuating nano-transducers. "Like real ants, they produce large forces for their weight. The challenge we now face is how to control that force for nano-machinery applications." The research suggests how to turn Van de Waals energy - the attraction between atoms and molecules - into elastic energy of polymers and release it very quickly. "The whole process is like a nano-spring," said Baumberg. "The smart part here is we make use of Van de Waals attraction of heavy metal particles to set the springs (polymers) and water molecules to release them, which is very reversible and reproducible." The team is currently working with Cambridge Enterprise, the University's commercialisation arm, and several other companies with the aim of commercialising this technology for microfluidics bio-applications.